Each of the five poems featured in this set of broadsides creates a world and landscape of its own. 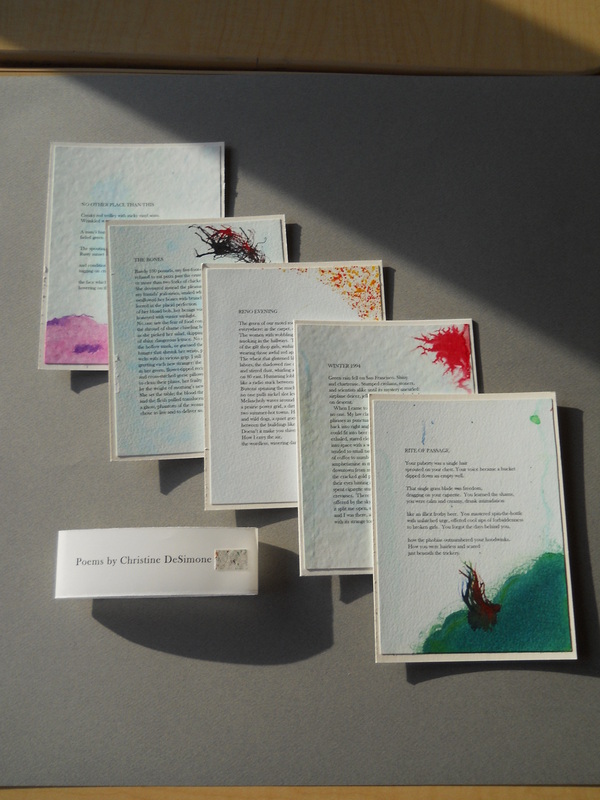 On each broadside is a hand-painted artifact suggesting a visual representation of the theme and mood of the poem, and the broadsides are tied together with a common background. All broadsides are mounted on archival matboard. Christine DeSimone is a fourth-generation Californian who practices law in San Francisco. Her poems have appeared in over 40 journals, including Alaska Quarterly Review, Cream City Review, Zyzzyva, and Pearl. Her first full-length collection, “How Long the Night Is,” will be published by Lummox Press in summer 2013.